If I have learned one thing over the past few years fishing for smallmouth….it is that you can’t predict what kind of mood they are going to be in. I have caught fish in a fury, hand over fist, until I was tired and in less than a day, in the same stream, went back and found few or any takers. To magnify the issue…winter is even tougher. The metabolism of most fish slow down and even those cold water species tend to go lower and move towards deeper pools. 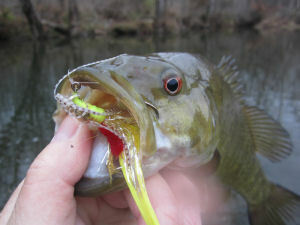 So….what are some things that can improve your odds at catching a nice smallmouth with a fly-rod? Here are three things that clearly give me an upper hand. I have a hard time with this as I am trained through the years to strip and retrieve my flies quickly and sometimes aggressively as most of the year a smallie can come quite a distance and do so aggressively to pursue and eat a fly. In the winter they need a slower presentation….and it must be done in deeper pools. I always try to picture fish and what they are doing as I present a fly and with smallies I can see that their bellies are on the bottom and they may pursue a fly if it is presented close by and presents an easy meal. 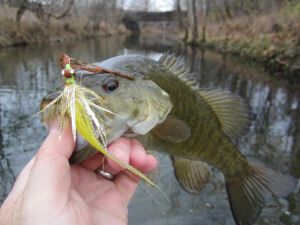 I like to fish across stream and jig/drag my flies back to me. Now….this means some snags and there is an art to not getting snagged….but at times the best have to wade in or simply break off a fly. I don’t mean that we need to have neon in our flies…but have wondered in some cases if it wouldn’t help? In the winter the fish are deeper in pools and at times the water itself can become very brackish and even lean towards being a black color. So….my winter color or choice is yellow. I use yellow bucktail, yellow thread and I palmer a gold fiber on the flies. I do all of this with the theory that if they can’t see it….they can’t eat it. You can mix and match with flies in your area….I used to wonder if yellow would push away fish….but that simply doesn’t happen for me. The other good thing with yellow is that it is very easy to see down deep in pools and my rule is simple when I see the yellow disappear….I set the hook. Now this doesn’t always work…but for the most part I do well. This is something I think more about in winter that any other time….by this I mean make sure that you are not spooking fish. You can do this with trash that has been kicked up….debris such as leaves, etc…. and when this goes into a hole…the fish get spooky. I also make sure to practice good casting technique and at times make long cast into small pools to keep my silhouette from being seen. The worst time for all of this to influence your catch rate is in winter when the water levels are down. If the pool is clear….then by all means move slowly and with caution. If you are a good trout fisherman…then in winter move and cast like you were casting to spooky trout….you will catch more smallies. So….in a nutshell; when winter rolls around, don’t put away the fly-rod…use your head and go about things with more precision. I love to catch a big, fat smallie in the winter as it really represents a challenge and a true trophy. Hope these tips help and lead to many bent rods in the future.